Cold winter days go hand in hand with rich comfort food. 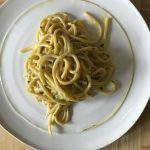 I don’t know about you, but these Bucatini alla Carbonara are something I could eat even when it’s not frigid outside. And so it happens, this was a dish we ate at the end of summer in Cleveland, Ohio. I really want to say I’m sorry for the long absence. My blog has been on my mind every day! There were some technical difficulties and also some creativity blocks. Not that I wasn’t cooking and baking almost every day these last months, but it takes time to sit down and get creative. Not only does it take time, it takes the desire. Besides the technical issues, I have had some personal things going on and really all I wanted was to be back in my blogging rhythm connecting with my food blog friends and all of you! Last year I started another journey in my life and have been studying energy healing. I am seeing local clients here in Florida at my office. If you are interested in a session, I am also doing distance energy healing (you have to try it!!). For those that have stuck around in lieu of my absence, I thank you! 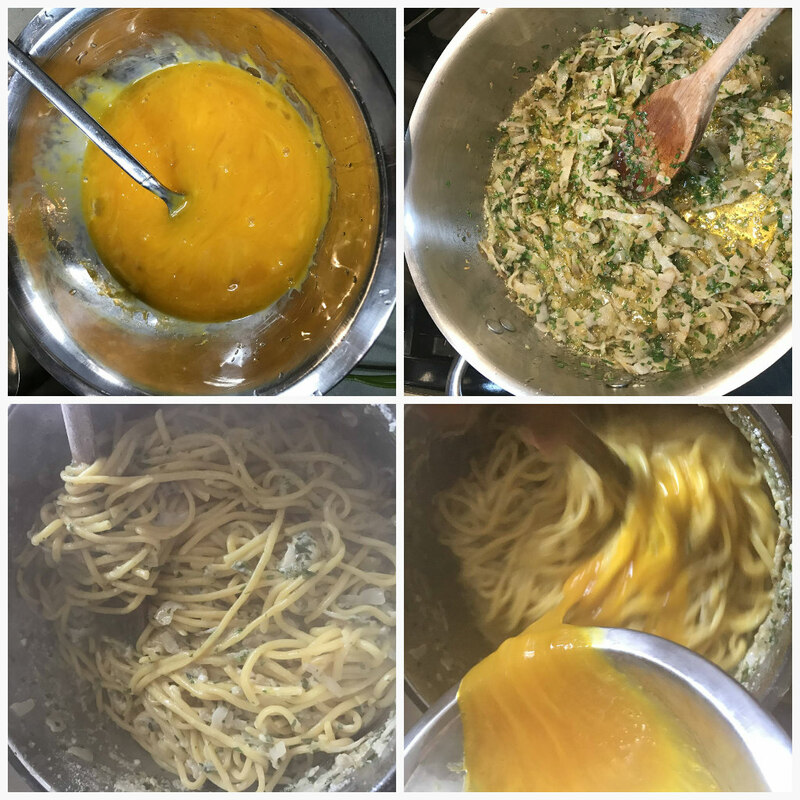 I have so much more to share and will be back again soon with another recipe! On to this incredible pasta! We were in Cleveland visiting family and like most places we visit, it’s all about the food. We usually are having lunch and planning dinner. I thought it happens only while we are in Italy at my mother-in-law’s and was happy to find out my cousin’s in Ohio do the exact same thing. Lucky for me my cousin’s wife is quite a talented chef and loves to bake and cook delightful recipes. Another fantastic thing about visiting Cleveland is all of the wonderful products you can find in just about any market. On this particular summer day, my husband and cousin went shopping and picked up delicious sliced meats from a really great deli, and the most incredible bread with crispy crusts. They also bought some bacon(they make the best bacon in Cleveland, really, they do!! 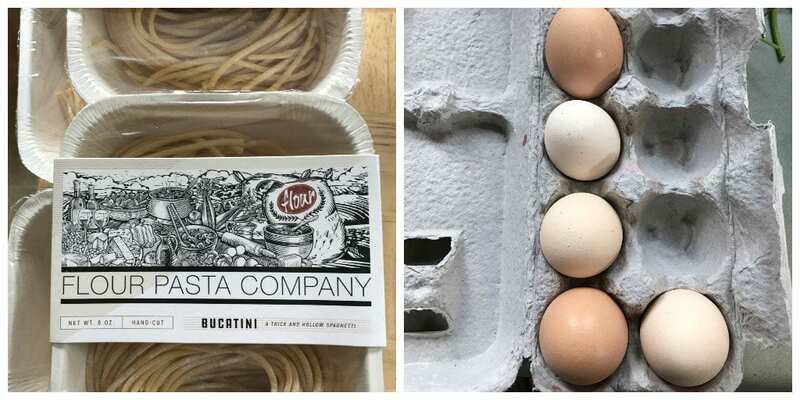 ), and this fantastic pasta that was used in this recipe from Flour Pasta Company. I’m not sure how we had any appetite left for pasta after snacking on all the sliced meats and the bread, but it was worth the sacrifice!! Carbonara can go from a luscious smooth sauce to scrambled eggs in a matter of seconds. Did you ever wonder about the origins of this dish? You probably have not unless you are really into the history of Italian food or if you happened to come across the story somewhere online. The name comes from carbonaro (which means charcoal burner in Italian), and it is believed by many that the dish was created to satisfy Italian charcoal workers after a long day at work. 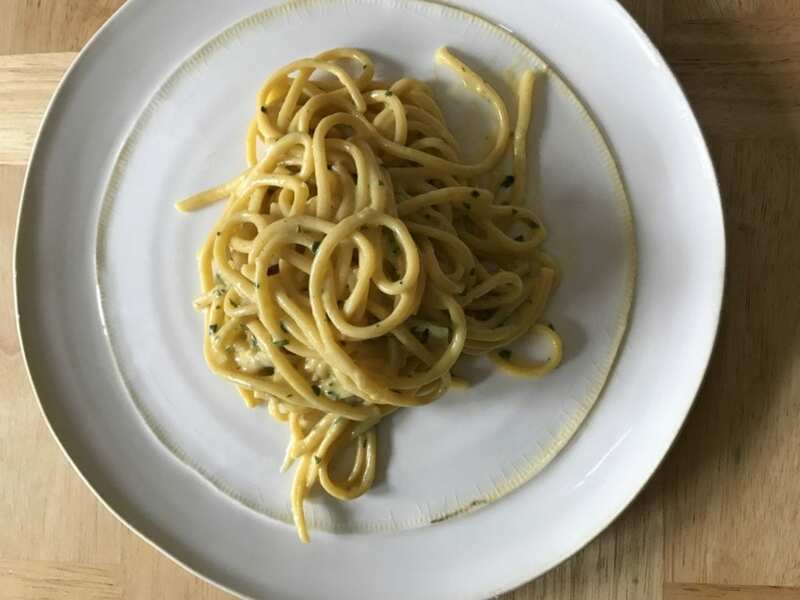 Carbonara is considered a “poor man’s pasta”. It is the perfect frugal meal and you probably have all the ingredients on hand to make it tonight! Some notes on this recipe: For this recipe, we made it was bacon that was from the West Side Market in Cleveland and it is not your average bacon. Typically we make it with pancetta, and when we are in Italy, it is with my mother-in-law’s homemade pancetta. I’m only suggesting that if you can look for some great pancetta or bacon, make it with that. If you can’t, it will still be delicious. The texture of the sauce should be creamy and you don’t want it too dry, so work fast! It takes some practice to reach the right consistency. Forget about 30 minutes or less…this is a recipe you can make in just 15 minutes! The time it takes to get you ingredients together and the water boiling. You whip up your egg sauce and you have the bacon (or pancetta)frying while you wait for the water to boil. It’s really that fast and easy. Like with most Italian recipes, adjust the cheese to your taste, and also the salt and pepper. I like more freshly ground pepper on a creamy and cheesy dish like this. A quick and delicious Italian pasta dinner. A rich combination of pasta, pancetta, eggs and cheese. So easy to make any night of the week. Heat the olive oil in a large skillet over medium heat until it ripples. Add the bacon and cook, stirring often, until crisp. Add the chopped parsley and combine. Set the pan aside. Beat the eggs with the milk and set aside. boil, add the bucatini. Stir frequently and cook until it is al dente. Drain, reserving the 1/2 cup of pasta water. with the pancetta. Then add the add the Parmigiano and the eggs yolks. Add pepper to taste and stir until thoroughly mixed. Glad to find you; so easy yet tasteful …. Tornero !